Best known for the classic ‘There's a Hippopotamus on Our Roof Eating Cake’ series, which is now a short film, Hazel Edwards writes for adults & children, runs non-boring writing workshops and is a regular keynote speaker. Hazel’s 200 books explore settings ranging from Antarctic expeditions to difficult personalities.‘Coping successfully with being different’ is a common theme in her fiction. 'f2m:the boywithin', co-written with Ryan Kennedy via Skype, is a 2011 White Ravens selection. Hazel uses performance scripts for literacy as well as junior e-mystery series such as 'Project Spy Kids' which stars sleuth Art, a resourceful non-reader. Julie Savage (Jules Savage-Milner) who co-wrote 'An 'L of a Difference', also worked in literacy, and is now a management consultant. I accepted the role of Ambassador for the 2012 National Year of Reading because I’m a readaholic. I read in the bath, listen to audio books in the car and have become obsessed with e-books as a ‘cool’ way of enticing new readers onscreen. A book or play enables you to ‘live’ from another’s perspective for the length of that story. Caro’s story is that of a 40-ish innovative problem-solver, who is literate by the end of the play. The ‘L’ refers to Literacy, L Plates and the ‘ell of a Difference that reading can make. 15 years ago, I co-wrote the audio play ‘An ‘L of a Difference’ with Julie Savage. It was performed on Radio RPH and printed by Bushfire Press. Much has changed since then, not only my co-author’s surname but our Caro character would no longer use polaroid shots to label her cosmetic business products with customer photos, because she was unable to read. She would use Ipad and the latest digital devices to help her read. (We’ve turned this into a discussion of the latest hi-tech aids to literacy and how actor-participants would ‘update’ the play.) The script is for performance by actors but the content is for those involved with literacy. We wrote this script 7 computers ago. But the reason for writing the humorous play about adult literacy has not changed. Originally I’d been requested by a 40 something woman for a play. And our ‘Shirley Valentine’ type character was created who ‘trades’ make-over skills with the dowdy tutor. Caro copes with a son on ‘L’ plates, a husband who leaves, forcing her to learn to read, and is helped by a neighbour artist who draws literacy clues. Others in her literacy class typify the reasons and approaches from ‘Could you read this for me, I’ve forgotten my glasses’ to the tradie, whose wife does all the bookwork, or the adolescent who wants his driver’s licence. Now I’m offering the script free, with extension activities, for community groups to perform in the 2012 National Year of Reading. If interested, see Performance Rights, below. 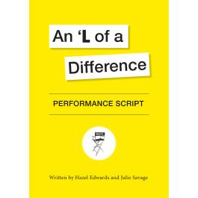 An ‘L of a Difference makes a great discussion-starter for conferences or performance on local radio. Why? Because shared humour is one way of tackling adult literacy, especially via performance, which ‘distances’ the personal issues. 1. Contact hazel@hazeledwards.com for permission to perform in 2012 National Year of Reading (Australia). Permission will be given for any literacy groups. • Exactly how did you spend your last 24 hours? • List everything you would not have been able to do, if unable to read or write. • For the next 24 hours, try to function without reading or writing. When was it most difficult? • What difficulties might arise in a household where one member was not functionally literate? Messages? Filling in forms? Street signs? Tax? Driver’s Licence? • Which technology helps if you are just learning to read?